Stewing beef cut from the chuck is the best choice for these long-simmered beef tips. 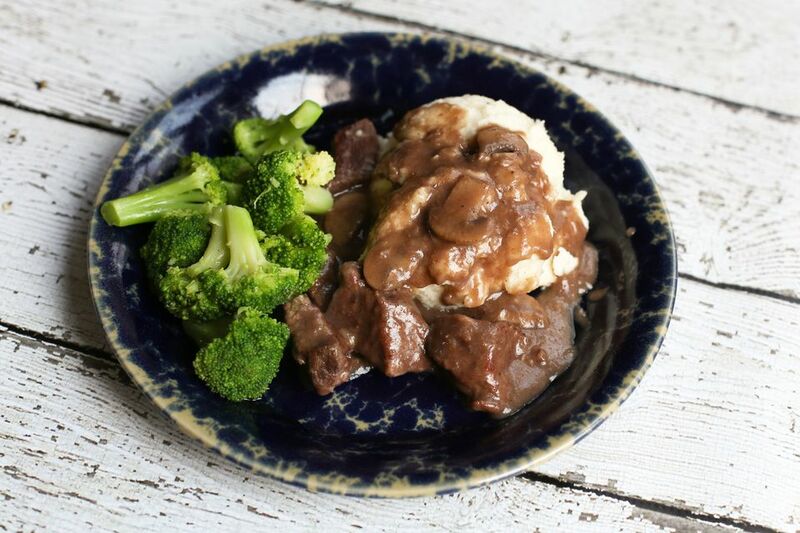 The beef tips simmer to perfection in a simple beef gravy mixture. The beef makes a tasty meal with mashed potatoes, noodles, or rice. Mashed cauliflower, zucchini noodles, or cauliflower rice are other excellent options as well if you're watching your carbs. Feel free to omit the mushrooms if you aren't a fan, or use canned drained sliced mushrooms in the dish. Cut the beef into bite-size pieces. Lightly rinse the mushrooms and pat dry with paper towels. Cut the mushrooms into 1/4 -inch slices. Heat 1 tablespoon of vegetable oil in a Dutch oven or large sauté pan over medium-high heat. When the oil is hot and shimmering, add the beef tips and sprinkle lightly with salt and pepper. Cook until the beef is browned, turning frequently. Then remove the beef tips to a plate and set aside. Heat the remaining vegetable oil in the same pan over medium heat. Add the diced onions and sliced mushrooms. Cook until the onions are translucent and the mushrooms are golden brown. Add the beef back to the pan along with the beef stock. Cover the pan and reduce the heat to low. Simmer for about 2 hours, or until the meat is fork-tender. In a small bowl or cup, combine the cornstarch or all-purpose flour with the cold water and stir until smooth. Stir the cornstarch or flour mixture into the simmering liquids. Cook, stirring, for a few more minutes, or until thickened. Taste and adjust the seasonings. About 20 minutes before the beef tips are ready, prepare the rice, noodles, or mashed potatoes. Serve the beef and its gravy with rice, potatoes, or noodles, along with a side vegetable. Combine the beef, mushrooms, onion, salt and pepper, and 1 cup of beef stock in the slow cooker. Cover and cook on low for 6 to 8 hours—or about 3 hours on high—or until the beef is very tender. Strain the liquids into a saucepan. Place it over medium heat and bring to a simmer. Combine the cornstarch and water to form a smooth mixture. Stir the cornstarch mixture into the liquids and cook, stirring, until thickened. Add the sauce back to the beef tips. If desired, use leaner beef tips and reduce the length of simmering time to about 30 minutes.